HAZEL CARROLL (1893-1983) was an extremely talented harpist who played in the early 1920s with the Seattle Symphony Orchestra. One of three daughters fathered by Seattle’s Charles Albert Bergstrom (1867?-1935), she eventually married Robert Ellsworth Carroll Jr. and while living in the University District (4205 Fifteenth Avenue NE), they bore a son, Gerald J. Carroll (who much later was captured as a POW in Germany during WWII). This image of the musician was taken at Fred Hartsook’s (1878-1930) photography studio in Seattle in 1925. 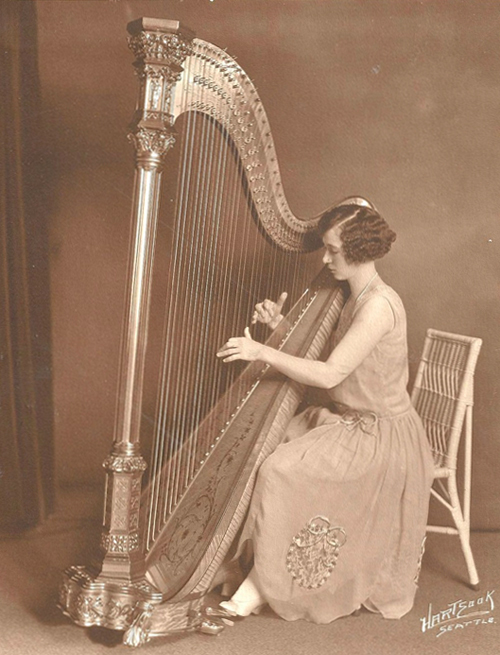 In November of that same year she left Seattle to take up advanced studies with the famed harpist Anna Louise David in New York City. While there she joined the New York Symphony – performing under Maestro Bruno Walters (1876-1962) – and at gigs including the esteemed Carnegie Hall and on nationwide tours. In the 1930s she became a member/officer of a social club, the Order of the Amaranth, which held their meetings at the Ballard Masonic Temple. In 1940 the Carrolls (715 Harrison Street) had a daughter, Paula, and in 1953 the family resettled in California, raised purebred Dalmatian dogs at their O’Carroll Kennels for a quarter century, and Carroll also got involved with the Petaluma Folk Dancers organization.